This time we didn't take the caravan but we rented a bungalow in a Center Parcs a couple of hours away from home, just to relax from the habitual tasks of looking after the animals, cleaning, going to vets etc. The very first night when we arrived we ate in the bungalow as most restaurants in the Parc were shut. The self-service restaurant didn't really have many options for eating vegan. There was a small supermarket in the center of the Parc (a Carrefour) that had some vegan products and we had brought some things from home. Pindy, our small parrot enjoyed the meal that he shared with us. The next day we went to look for a supermarket in the area. 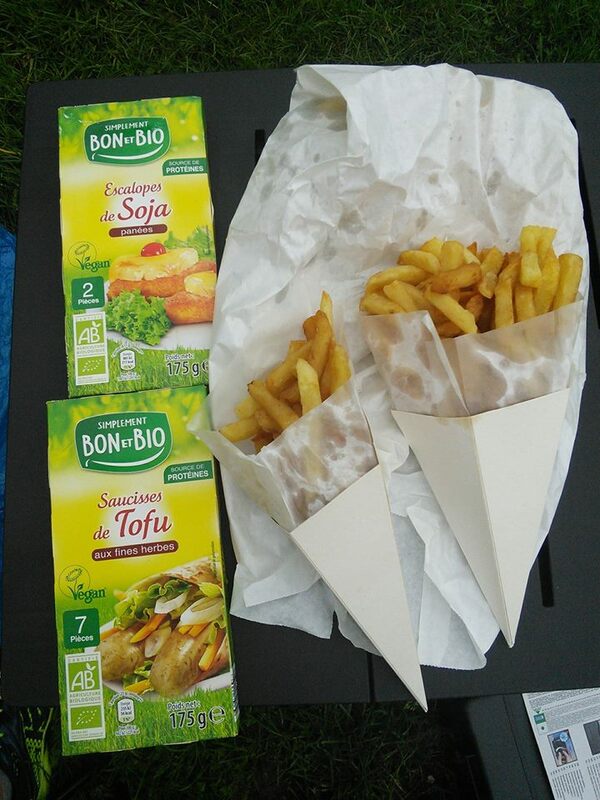 We found a small Auchan in Ferté St. Aubin where there was plenty of vegan food available. Again always check the label in case it contains eggs or milk products. We did most of our shopping there in order to stock up for a couple of days. That evening we went to the Italian restaurant Il Giardino in the Parc. They were very pleasant and flexible. You could order a vegetarian pizza (there were several options) without the cheese and add other ingredients instead. We had a very enjoyable meal. At the end they asked us whether we would like to fill in a survey and of course we mentioned that more vegan options would have been very welcome. Otherwise we were very happy with the service. Most days we ate at home. We visited the town of Orléans one day, where we were surprised to find a little shop called Etik & Bio https://www.etiketbio.eu/index.php with plenty of organic (so not vegan) and also vegan products. We decided to do a wine, bread and vegan cheese party at home so we bought a number of vegan cheeses. Some were very nice, others were a bit disappointing. The stay in the parc was very pleasant. We were visited by a peacock the very first day and when he found out there was food available for him he called the others. In the end every morning we heard them hammer on the door for breakfast so Henrietta had to share her grains with up to 9 peacocks. The purpose of this trip was to attend three demonstrations: one in Paris against hunting in France, a demonstration in Holland against the culling of 1000 deer in the #Oostvaardersplassen (which in the end did not take place) and a demonstration in London asking for another vote for Brexit. We found out however that even though they mention vegan, the options can be limited so always phone in advance to avoid making long trips through Paris only to find out that the restaurant can't really provide you with a vegan meal. The very first day we had a hamburger at the demonstration from a traiteur/restaurant called My Kitchen: www.mykitchn.fr/Welcome.html. They were very nice. The second day we stayed in Maison Lafitte, a very pleasant little suburb from Paris. We had a beer in the local brasserie Le Cosy http://www.lecosy.fr/fr/ and afterwards headed to one of the Indian restaurants in Maison Lafitte: Ganesh https://ganesh78.business.site/ where we had a lovely indian meal. Next day we headed for Calais. We popped into the Auchan where again vegan options were plenty. There is really no excuse any more for wanting to eat meat or cheese. The second night we went Indian again, where we had our very best indian meal in France ever. The restaurant is called Bollywood https://www.facebook.com/Bollywoodcalais/ They also do buffets during the week. Conclusion. Again if you ask restaurants whether they have something vegan they always do or they can prepare you something special. Veganism is getting more common especially in the larger cities and also the supermarkets mostly have vegan options. But do check the labels. Milk or eggs are still used in many vegetarian products. The chain of shops of "La vie claire" was a good find during this trip. Organic is always better. We have been going on trips now for a year and we have the impression that things are already getting easier than a year ago. En route to Avignon from the Vendée we decided to stop overnight somewhere halfway. 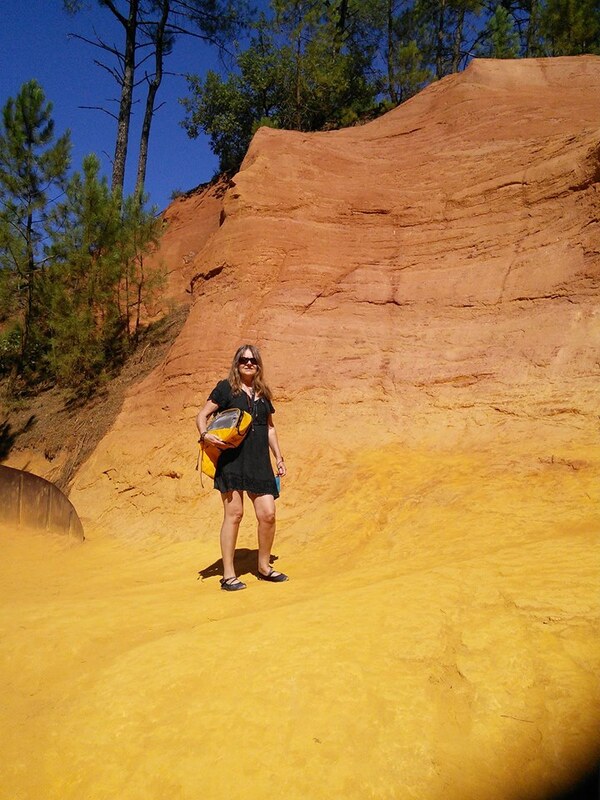 So we stayed for one night in the Campsite Camping Domaine de La Faurie in Seniergues. While checking in we were asked if we wanted to eat at the restaurant later that evening. We hesitated and answered that we probably couldn’t as we were vegan. This did not seem to be a problem at all. After all the paperwork and payment for one night was done we went together with the man from reception to speak with the cook. She suggested a salad and mashed violet potatoes: an unusual sight. We could bring our own eggs (from our pet chickens from home) and vegan cheeses and sausages. We had a lovely meal while enjoying a wonderful view over the Dordogne landscape. Next day we reached our final destination Avignon. The first evening we ate at the campsite and investigated our options to eat out for the coming days. There are a number of purely vegetarian/vegan restaurants and some more restaurants mention that vegans or vegetarians are welcome. So enough choice to keep us fed for the coming days. 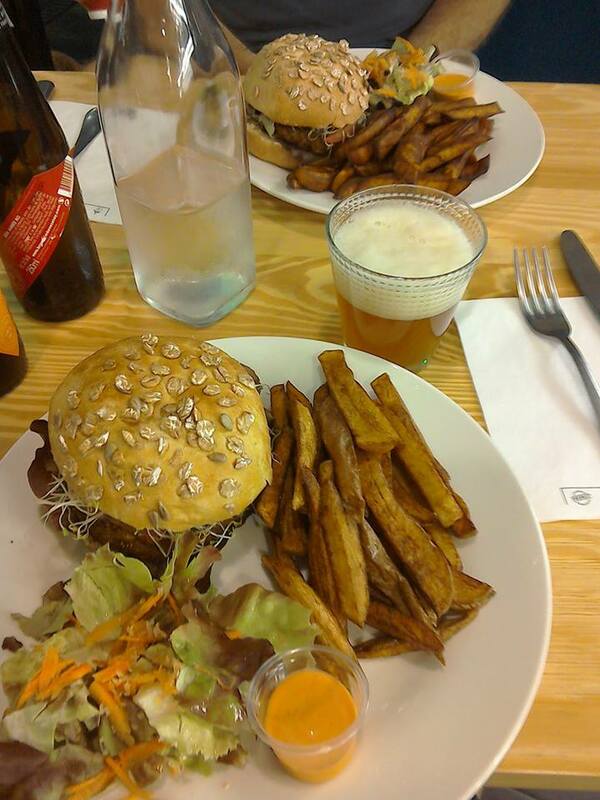 However we only went to the vegan restaurant Chic Planète and ate a burger. 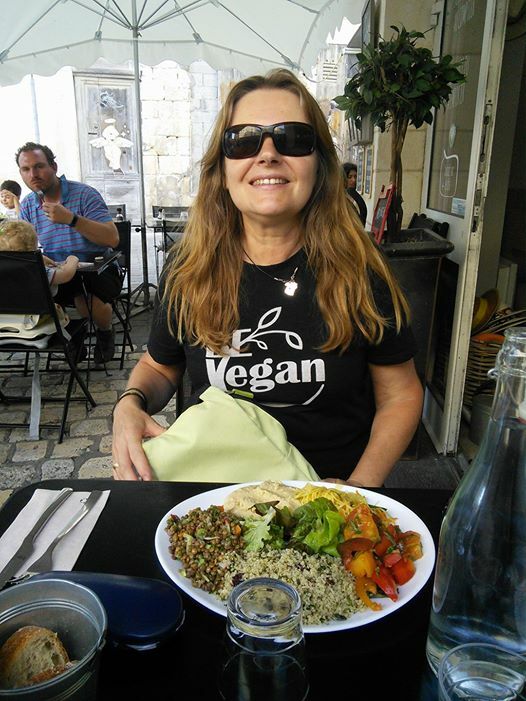 The meal was good, there was a warm welcome from the owner with whom we had a little chat about veganism in France and how it gets more and more common. He’s investigating the possibility to open a vegan restaurant/shop also in Marseille. Our stay was shortened because it was over 31°C. So we decided to head north, on our way back home again. We stayed for 2 days in Montech.The restaurant in the centre of town was prepared to cook vegan. However their opening hours were not convenient for us, only every day during lunchtime and only on Thursday, Friday and Saturday evenings. One night we went to Montauban for an evening meal. Here again when we asked a restaurant whether they were prepared to cook a vegan option, they were very helpful and said that wasn’t a problem at all. We finally ended up in a Indian restaurant Délice Indien on the Place Nationale and had a very nice and pleasant meal. Indian cuisine always has plenty of vegan options. Next day we headed for home. 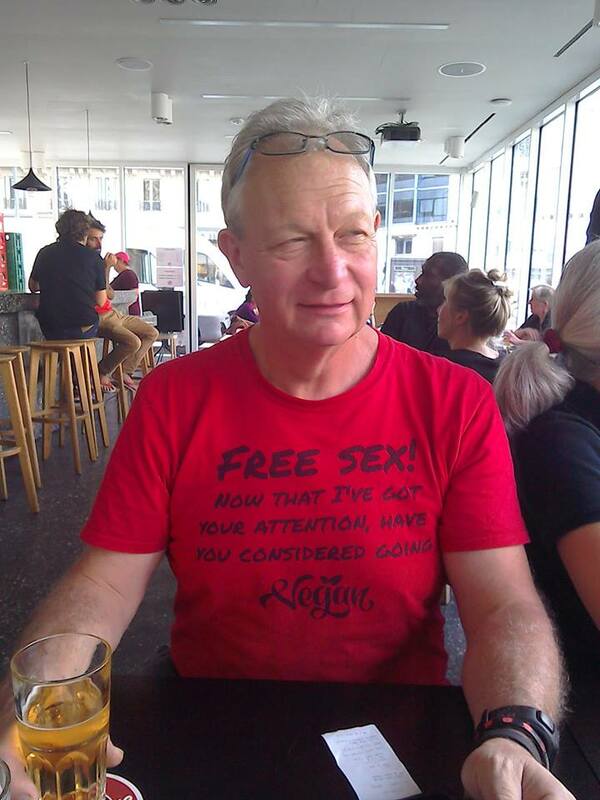 It was too hot to travel any more …. In conclusion, travelling when you are a vegan is getting more easy also in France. The shops like Lidl have vegan options from time to time. And in general when you ask a restaurant people are not shocked and you you get a very friendly reply that the cook is willing to prepare you a vegan meal. It is early July. There is a heat wave in the Vendée. So we decide to go a bit more north, to Brittany where the temperatures would cool down a bit in the coming weeks. We arrive, early evening, after a very hot trip without airconditioning in the car, at the campsite Les Pins close to Crozon. https://www.camping-crozon-lespins.com/campsite-france-brit… Setting up camp takes us now about an hour. It's our aim to eat out as much as possible, but tired and have taken some leftovers from home we decide to eat at the campsite. 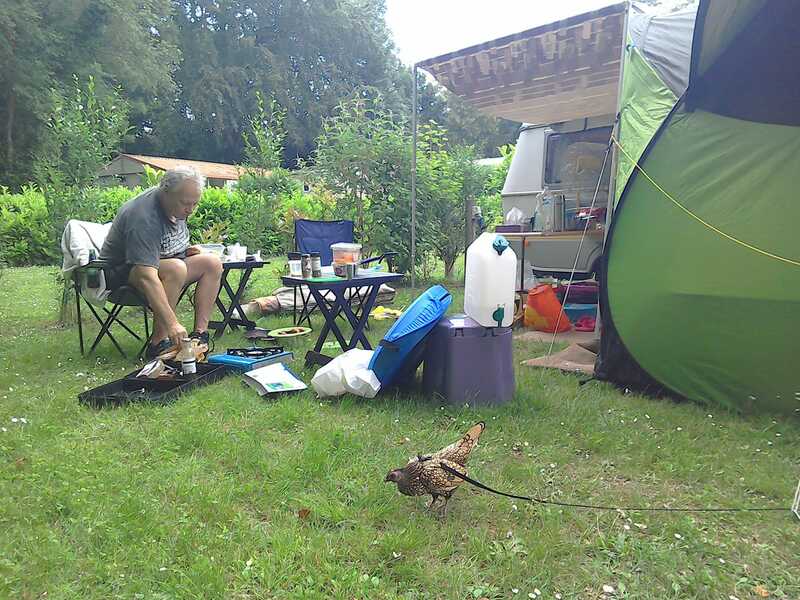 Gives us all some time to stretch our legs, Henrietta, our pet chicken on her lead investigates the area for bugs and herbs and Pindy likes the protection of the tents. The first day our first mission impossible is to find some vegan products in the nearby supermarkets. It is a Sunday. The only supermarket that is open is an E Leclerc Express in Tal ar Groas. There is nothing vegan at all, but there are some vegetarian products. Again what seems to be vegan, in french "végétale", does very often contain milk or egg products. So be careful and always read the labels. We come back with some essentials like carottes rappées, taboulé, and other salads etc.... The evening we eat out in a small beach village called Morgat, near to Crozon. Lovely ambiance. 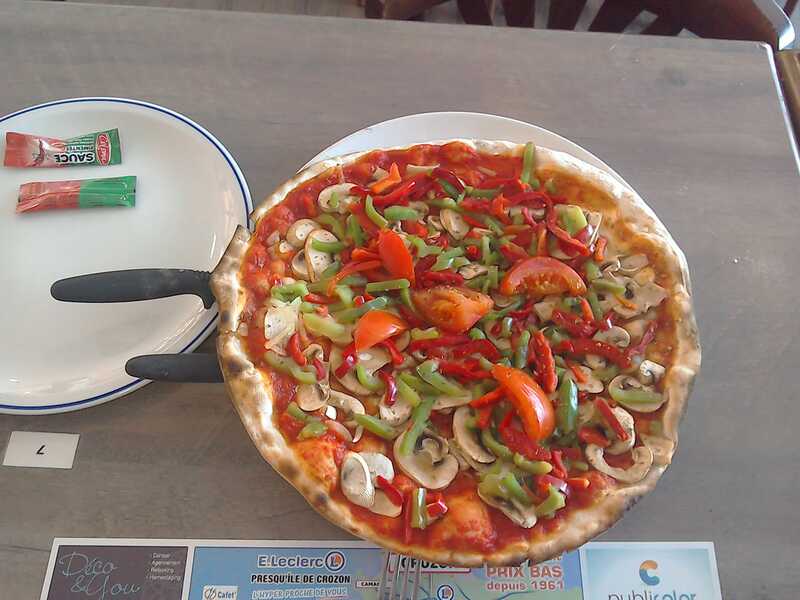 We end up in a restaurant called "La Flambée" https://www.facebook.com/laflambee29/ that serves vegetarian pizza's. They are mentioned on the menu, so we ask if it would be possible to leave off the cheese. Very friendly people and a very nice meal. Day 2 It starts to rain. Everything is wet as we didn't really prepare for it to rain. However, our day isn't ruined. While things are drying we spend the day in the caravan with the animals and pamper ourselves with some gin and tonics. Day 3 Time to do a proper shop. 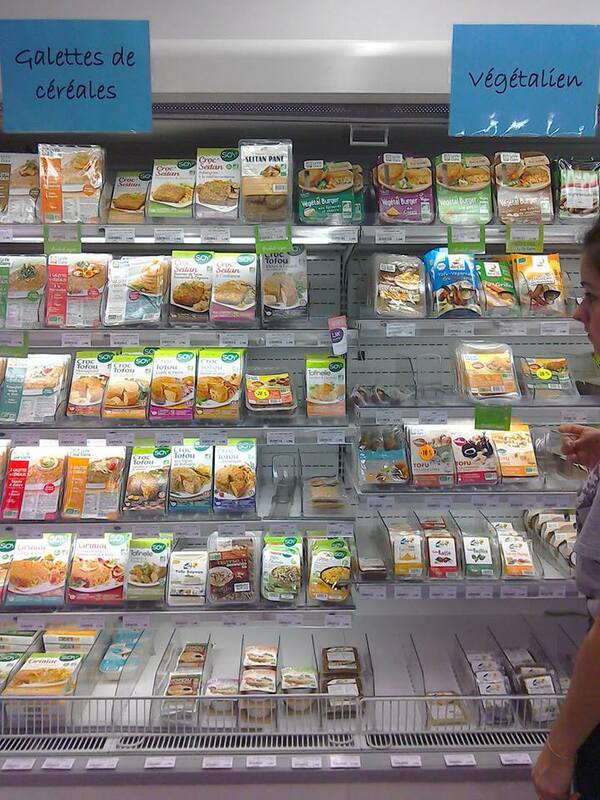 The E Leclerc in Crozon is very well equipped with vegan products. We buy the most important things to keep us going for the rest of the week. 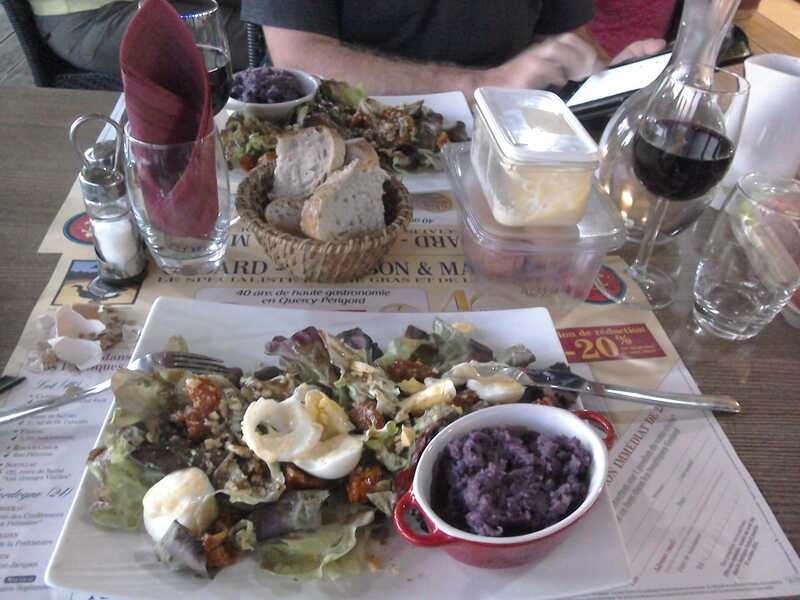 After a stroll over the rocks and on the beach at La Pointe de Dinan https://www.tripadvisor.fr/Attraction_Review-g1194610-d7040…, (we come back with a small plastic bag with rubbish found on the beach) we have a light lunch with plenty of veggies and bread. A red squirrel and a blue jay join us. We aim to eat out again in the nearby village of Camaret sur Mer. However, due to car problems we decide to stay in and eat our meal at the campsite. Day 4 The car starts again. 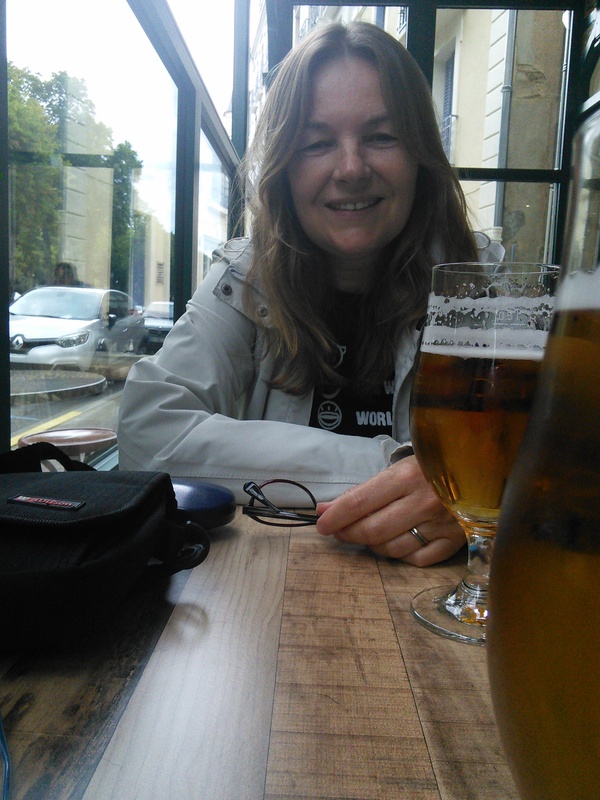 So that evening we make a second attempt to go out and find a restaurant in Camaret sur Mer. The Finistère is well known for its seafood. So not much of interest for vegans, unfortunately. So we end up in an Irish Pub called "the Donegan" https://www.facebook.com/The-Donegan-1495643490653172/ for a drink. Becoming peckish after one pint of beer we ask whether it would be possible to order a vegetarian pizza without cheese. Again pizza was our best option for that evening. Day 5 After a lot of organization for getting a replacement car (read more about our car problems on our timeline https://www.facebook.com/permalink.php?story_fbid=550364762026258&id=100011582169346 ) , we end up in Camaret sur Mer again. We visit our "local" pub again for a drink and to do some internetting. We were not very confident in finding another restaurant that serves vegan food. However, on the way back to the car, we see a sign on the pavement with the words "vegan welcome". 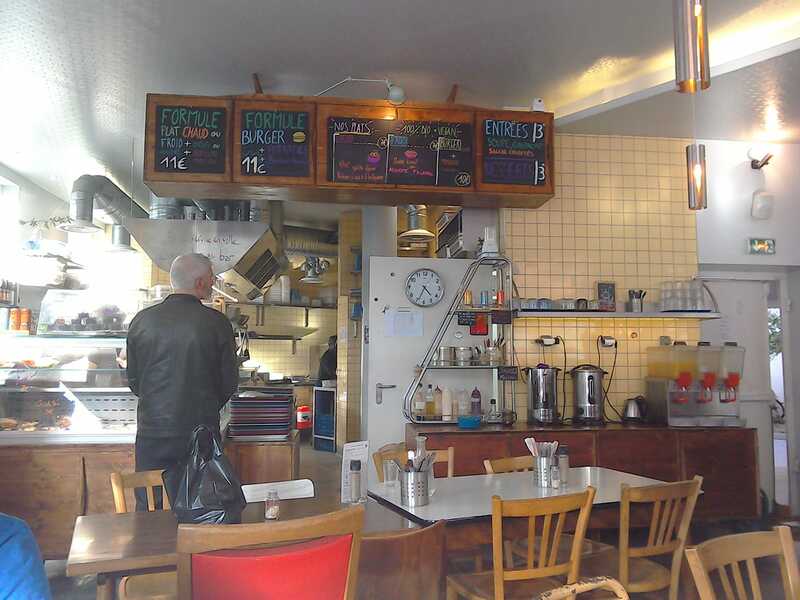 With great enthusiasm, we enter the restaurant called "Bistro/crêperie La Marine" https://www.tripadvisor.fr/Restaurant_Review-g1087668-d6855… and order a vegan pancake and a salad. Very friendly staff who are really prepared to help. We have a little chat about veganism. They told us it is becoming more and more normal even in the Finistère . Our last day before leaving for home, we go back to the E Leclerc in Crozon to do some last shopping, where we also end up eating a vegan pizza in their cafeteria for lunch. As you might have been able to read on our Blog, at the beginning of June we went to see the notorious nature reserve in the Netherlands, the Oostvaardersplassen (you can read more about it here) . Of course, once again, we took our little caravan and our pet birds with us. As the trip was quite long we had to make some stopovers. The first one was in the North Department. We stopped at a campsite called Les Colombes in Douai. It had been a long day so after having set up camp we didn't really feel like going out for a meal. So we went to an Aldi supermarket nearby for some of their vegan products. And there was also a "friterie" in the town. So our first night on the road we had to improvise a little bit. But it hit the right spot. In the Netherlands we set up camp in the nature campsite the Kemphaan. We mainly cooked our own meals (vegan cheese tosties with salads, pasta with tomato sauce, vegan sausages and vegetables). 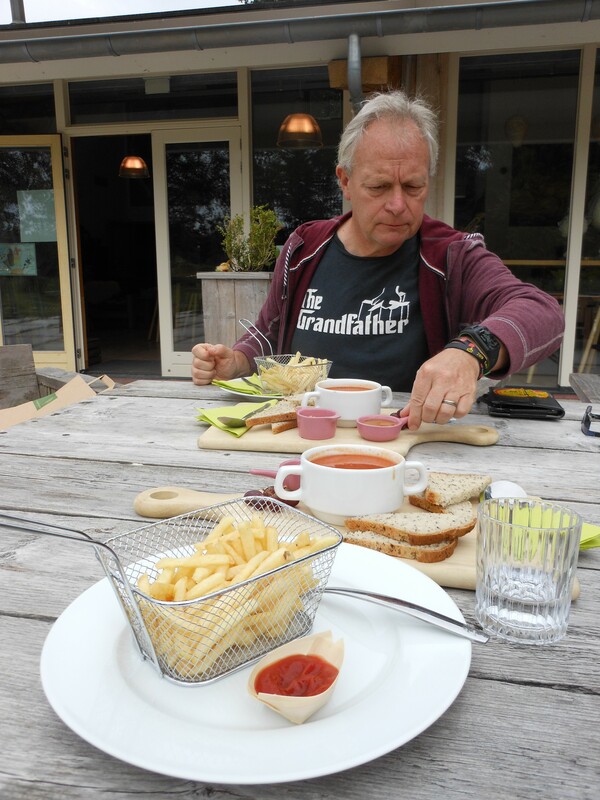 One day we went out for lunch in the restaurant Buitengewoon Lekker. We asked whether they had something vegan. They prepared especially for us some vegan dishes. They were very pleasant and nice and not at all surprised by our request. Our second meal out was in the Tasty Wok in Lelystad. This is a self-service Chinese restaurant, so you can chose whatever you like. The wok options are very good, plenty of veggies, white rice (to avoid the egg in the noodles or fried rice). It is standard price for everyone (30 euros per person) drinks included. Our last stop before coming home was in the campsite Château des Tilleuls . We had a very pleasant reception and enjoyed our stay in this campsite. We had a nice evening in, cooking our own marinated ¨Big Steaks¨ from Vantastic Foods. At the campsite's snack bar we bought chips and salad to accompany our meal. The next day we headed for home. The beginning of October, a month after our last trip, we went on our third vegan trip. This time we chose a location reasonably close, only 3 1/2 hours drive away from home: Lacanau Océan, a small town on the Atlantic coast to the west of Bordeaux in the Gironde department/Nouvelle Aquitaine region. We had to decide at the very last moment whether we could leave as one of our cats just had an operation on her teeth. We do have someone come to stay in the house when we leave, but we don't like to go away knowing an animal is poorly and needs extra attention. Having a caravan is easy in that respect as you can leave without having to book a house or chalet in advance. So we packed in somewhat of a rush just the day before leaving. 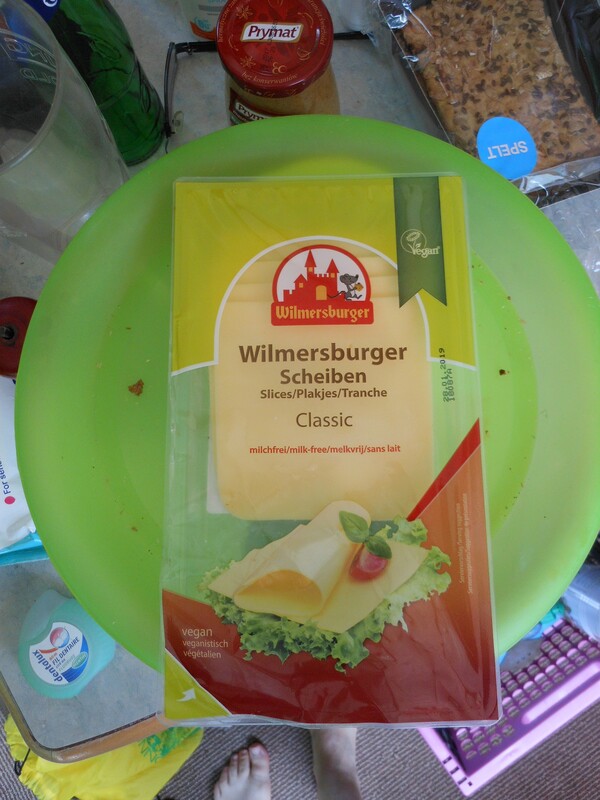 As you could perhaps have guessed, once we were a few hundred kilometers from home we started to realise that we had forgotten some things such as our vegan cheeses, meat replacements etc. which was a shame as we had brought our toasty maker with us. It was clear that a visit to the shops would be necessary once we had settled in, in order to have something to eat that night. The 4 star camp site where we stayed, the Airotel l'Océan Camping and Spa , is located in the north of the Landes de Gascogne Regional Natural park not far from the ocean in a beautiful setting of an old pine tree forest. It is on the outskirts of the town of Lacanau Océan, where surfing seems to be the main attraction, so we could easily walk into town to the restaurants and to do our shopping. We only visited one of the town's supermarkets, the U Express where the choice of vegan and vegetarian products is very limited. The very first evening we had to make do with a vegetable/bean burger on bread. For more comprehensive shopping we took our car the following day and drove to several supermarkets in neighboring villages. Surprisingly there was nothing of their vegan range to be found in the Aldi in Hourtin which was about 25 minutes drive from our base camp. So pushed on further to Lesparre which boasts a Lidl and an E. Leclerc. The Lidl also had no range of vegan products but the E.Leclerc did. So it was there that we stocked up our food supply for the coming days with various meat replacements, cold meats and also bought a new kettle as we had forgotten to bring one with us. As for eating out, perhaps because Lacanau Océan is a surfing town, the vegetarian options in restaurants were quite good. We did a search on the internet for "restaurants végan/végétarien" and mainly got results on the Trip Advisor site and the site of https://www.lafourchette.com/ which is in French. Unfortunately, some of the restaurants with the best reviews had already closed for the season and wouldn't reopen until April next year. We had a very good meal at a restaurant called "Le Monkey", where they specifically prepared a vegan meal for us based on pasta and vegetables of the season. The african atmosphere is remarkable and very pleasant. We really recommend a visit. We were lucky that we went there on the day after our arrival as it closed for the season a couple of days later.. Another evening we ate in a Moroccan restaurant: Riad Marrakech . The staff were very friendly and the food was nice. We had a little companion at our table, a black cat begging for food, but we couldn't offer her anything that she found acceptable as we didn't have any meat so she preferred our neighbors' table. The final restaurant of our stay was a pizzeria called ROMA where we had a vegetarian pizza, without cheese, that we really enjoyed. We rejected a restaurant called La Cabane feeding people on Ostrich, Zebra, Crocodile, Kangaroo and all sorts of other exotic meats, even though they did have a vegetarian option. The fact that you don't eat any animal products in restaurants was never seen as strange or odd with nobody appearing surprised at our requests. We had the impression that this was possibly due to fact that we were in a tourist destination. 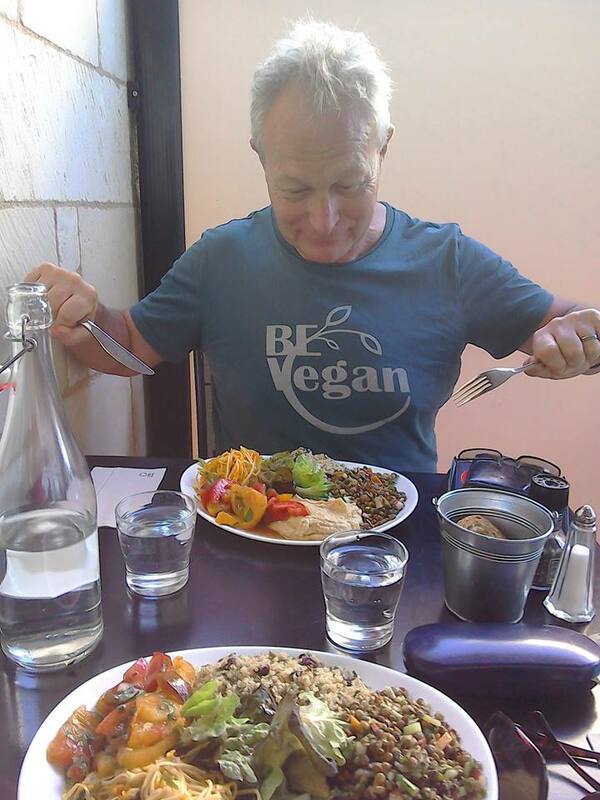 Veganism is more and more common amongst international tourists and restaurants adapt to this. However, the lack of vegan meat replacements in the supermarkets that we visited was a disappointment. Our second vegan trip was aimed to be to the Haute Savoie from where we would make a couple of city trips to Genève. A problem with the turbo of the car however made us decide to stay at the very first camping we had booked which was located in the Allier department in a lovely spa village called Néries les Bains. 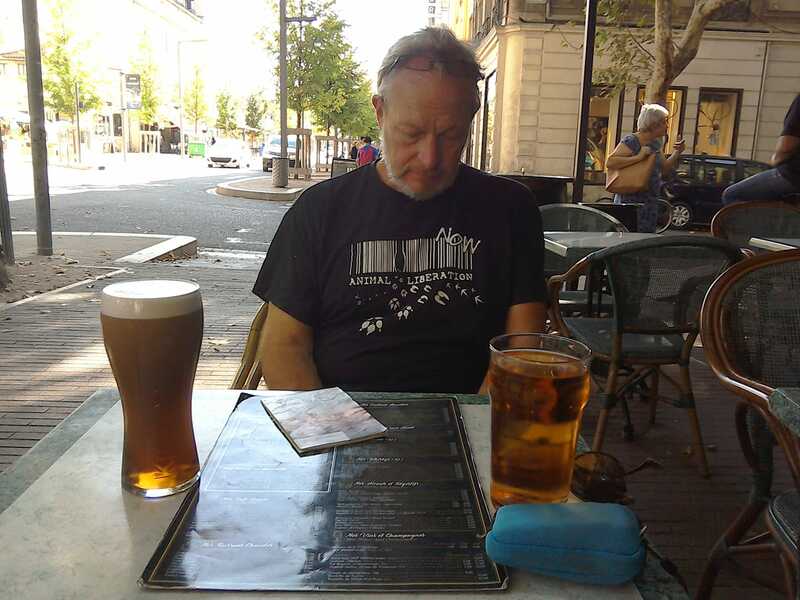 It was a lucky choice, as we were close to the major town of Montluçon for shopping, but the camping itself was in a green, hilly, woody, touristy area with a small village nearby so that we could go out on foot, have a drink in the pub, listen to live music and come back without having to drive. The very first evening we arrived at the camping it was quite late. Shops and restaurants were shut by the time we had set up camp. We had brought vegan cheese and sausage, bread and our toasty maker, so all we had that day was a couple of vegan toasties. For breakfast next morning and the following mornings we had brought our usual breakfast: a homemade fruit smoothie (from peaches off our own trees), cereals, soya milk, fruit, orange juice and coffee. As we do eat the eggs of our chickens we brought some boiled eggs and mayonnaise made from our own eggs. 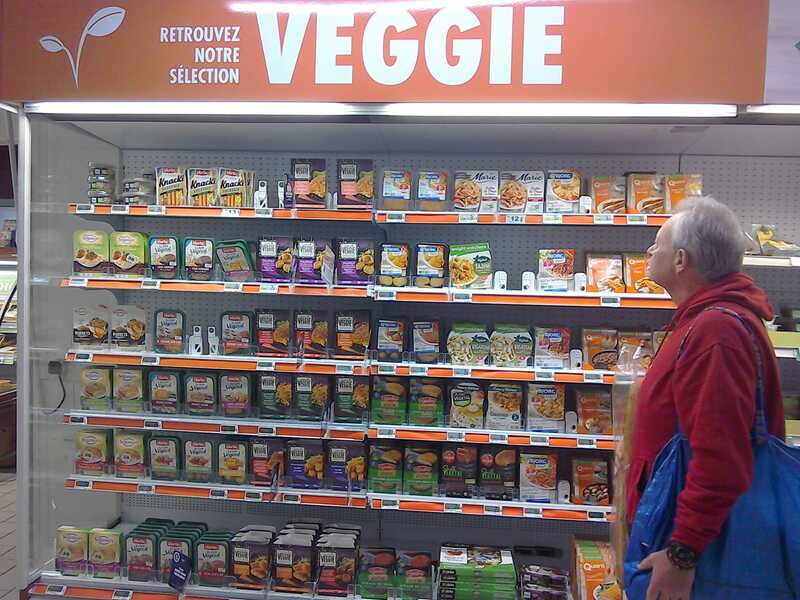 In the Carrefour in Montluçon, we found a reasonable range of vegan products (which in french is called 'produit végétal' ) like vegan hamburgers, vegan chicken nuggets, seitan stirfry pieces and meatfree salamie and cold meats from La Jasse, 'l'Instant végétal', which were supposed to be vegan as it said végétal on the package. However as we found out later the salamies still contained eggs, so you have to read the label to make sure products are really vegan. In a food supermarket Le Grand Frais in Montluçon , we also found several vegan products, but again the “vegan” salamies still contained egg and so were not totally vegan. 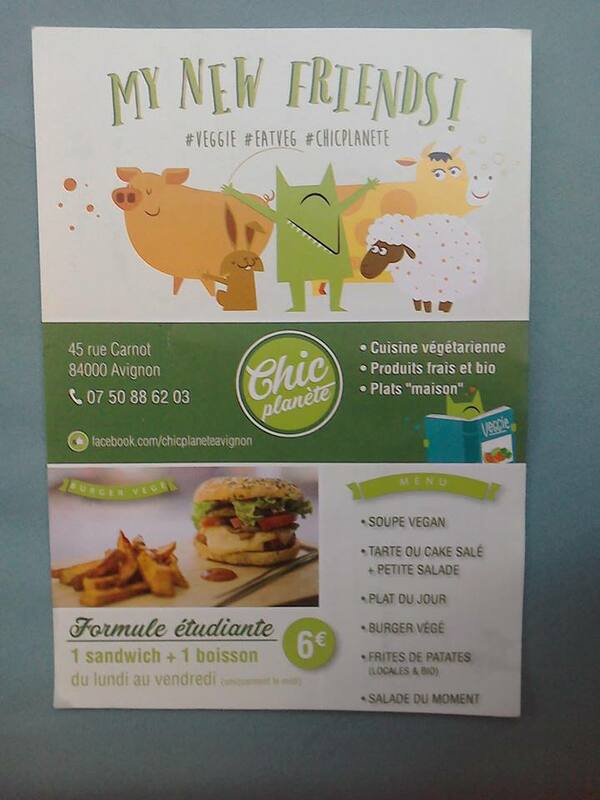 On our trip to Moulins we found several vegan products in the Intermarché in Moulins but here also supposedly vegan products like lasagna végétal of 'les Végétales de Monique Ranou' and vegan cold meat from 'Fleury Michon' contained egg and/or milk. On our trip back home from Moulins we popped in an Aldi in Commentry where we found relatively cheap, vegan charcuterie and sausages from “Simplement Bon et Bio”, this time to our relief, without egg products. 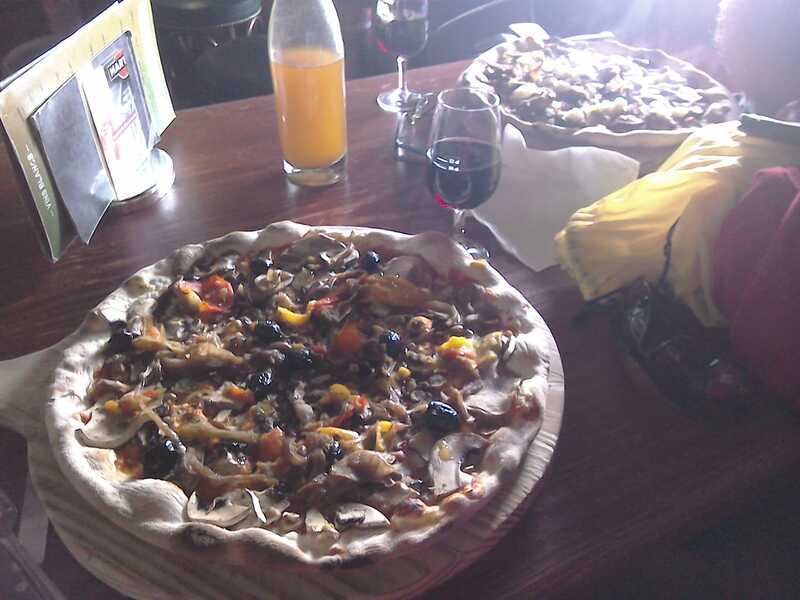 As for eating out, we went to an Italian type restaurant 'La Brasserie' in Néries les Bains where you could order a vegetarian pizza. We asked them to leave out the cheese on the pizza. Even without cheese the pizzas were remarkably nice. Another day we ate in an Asian Wok restaurant 'Royal Xia' in Montluçon, where vegan options were plenty. Just leave out the meat and seafood. 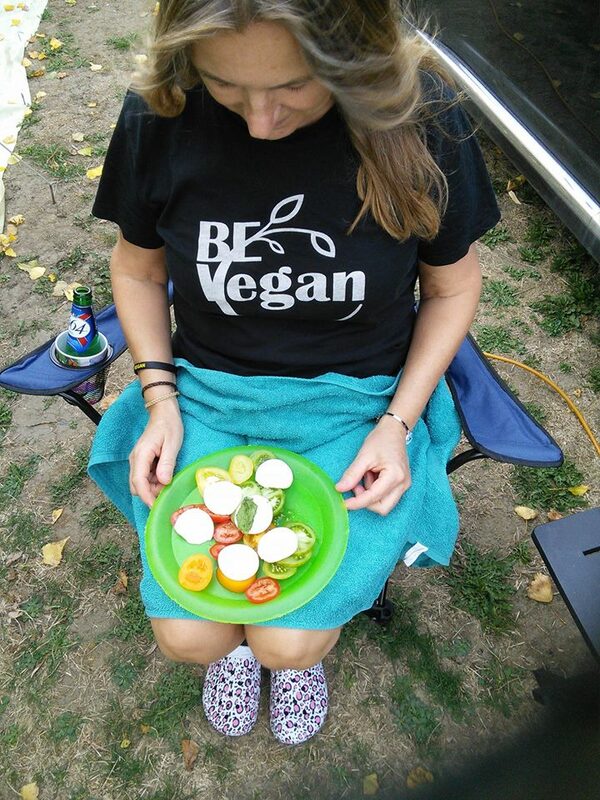 Of course camping gives you the possibility to prepare your own meals with vegan meat replacements like hamburgers, sausages, etc. however eating out in restaurants was no problem at all depending on the restaurant you choose of course. And people were very helpful in general. Products vary from supermarket to supermarket so you don't have to eat the same meat-replacement every day. 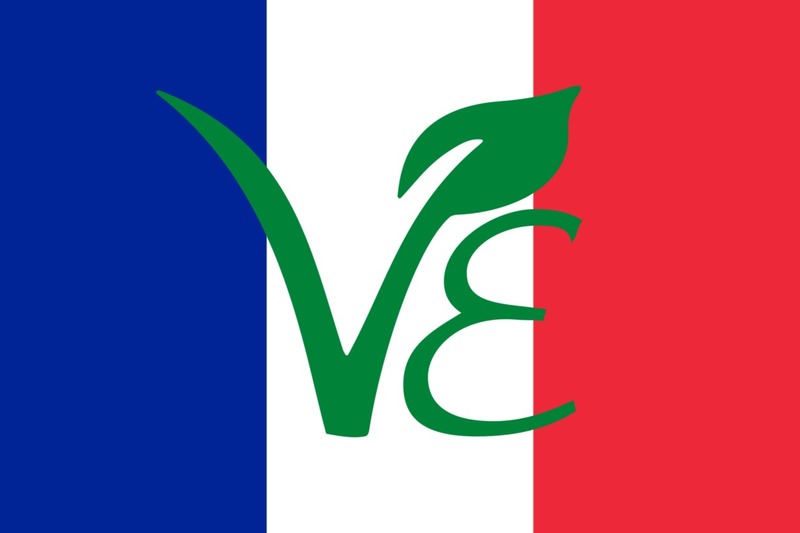 However it is important to read the labels, as 'produit végétal' even with the Ⓥ or V sign is not garanteed to be vegan (so without milk and/or egg products). 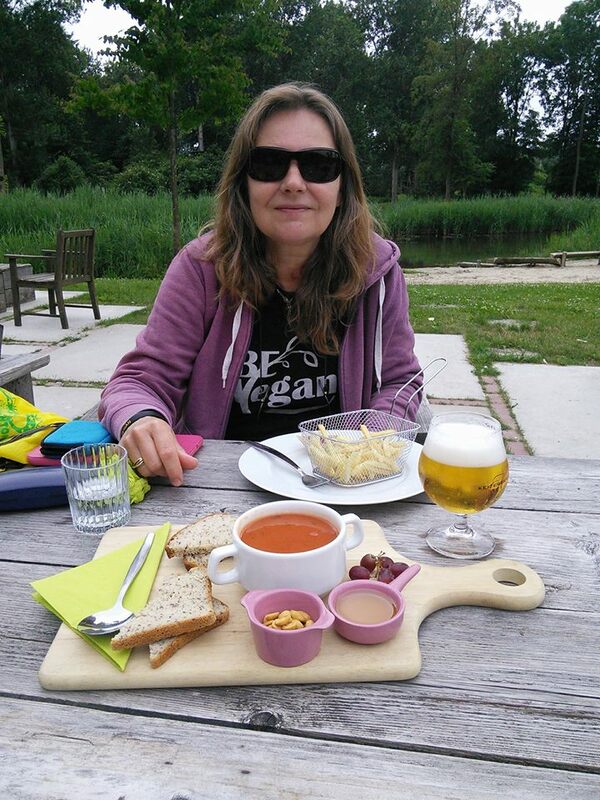 The start of our "Vegan Tour de France"
Although having lived in France now for many years we have never really had the opportunity to enjoy visiting the country. When we came here our first priority was the house, then the garden and the fields. Then we got involved in the association for the protection of animals NALA that has taken most of our time until recently. We thought it was about time to travel a bit so we bought a little caravan, an old Eriba Puck, with an awning. Yesterday was our very first trial trip to La Rochelle which is only about an hour away from us. With the car laden with our lugage in the back, our tiny pet chickens in their tent and our green-cheeked conure parrot, Pindy, on the backseat we left. Of course, we expected a little bit of traffic as it is peak holiday season at the moment. What we didn't expect though was a blockage of the main tourist road by farmers protesting for the umpteenth time that they aren't being kept by the taxpayer in the manner to which they are accustomed. 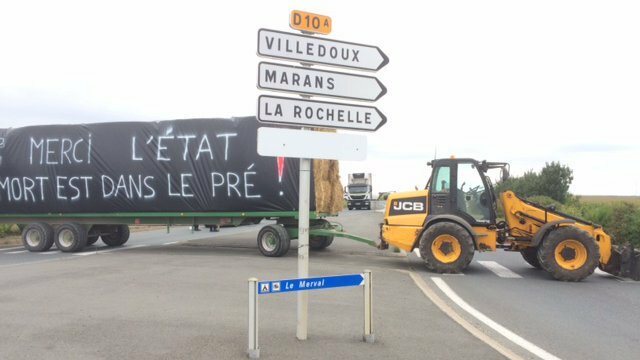 We had planned to camp in a camping site in La Rochelle, but traffic was impossible. Luckily when it came to a dead halt we are only two cars away from a side road that had a sign post announcing a campsite "Le Merval" . So we decided to stop there. It was the receptionist who informed us about the farmers' protest and told us that they didn't know how long it would go on for. So we just took it easy and set up camp and then had a bite to eat, while we waited for the immense traffic jam to disperse.